Just Listed! 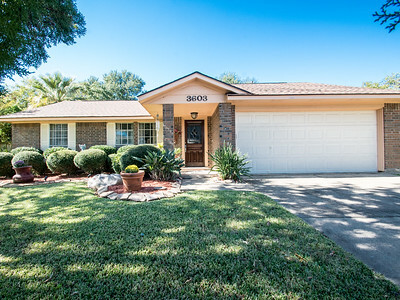 Charming home on corner lot with backyard PARADISE. Must See, Move-in Ready! This charming home with a hard to find BACKYARD PARADISE sits on corner lot at the end of a quiet street. Assets of the home include: sun filled living room with high ceilings and wood burning fireplace, light, bright and open island kitchen with granite counters and adjoining breakfast room, cozy formal dining can be used as study/tv room, spacious master bedroom suite with walk-in tile shower, crown moldings, vertical blinds, tile flooring through-out, gorgeous grounds with beautiful landscaping features include: square palapa with decking, Gazebo, umbrella sitting area, fiberglass shell bathing pool measures 16x8x4, backyard tool shed, corner, quiet lot, approx. two year old roof, sprinkler system, built-ins/floating shelves in garage, approx. 400 sq. ft attic storage, refrigerator/washer/dryer/gas grill ALL INCLUDED! Don’t wait on this rare opportunity to buy today and move-in tomorrow just in time for the holidays! !